At some point in your project building career, you are likely to come to a realization that having a tow vehicle is a good idea. Back in 2005, DSPORT purchased a RAM 3500 pickup with a Cummins diesel. This vehicle proved to be an excellent choice for hauling merchandise to trade shows and events or trailering a project car. However, it’s only during those outings that we really use “the truck.” Since it doesn’t make sense for everyone to have such a specialized-use vehicle in their stable, we started thinking about the concept of a budget-oriented, luxury vehicle that could also tow. Essentially, it would be something you wouldn’t mind driving every day, but it could also do some towing on occasion. As for the target budget, we wanted to get into the vehicle for under $10K and have a total build cost under $15K. Ultimately, we ended up Project BLT, the 2005 Cadillac Escalade 2WD featured here. The logic and adventures that got us to this point should help a number of those wishing to take a similar path. Cadillac is a name synonymous with luxury, but rarely with budget or towing. 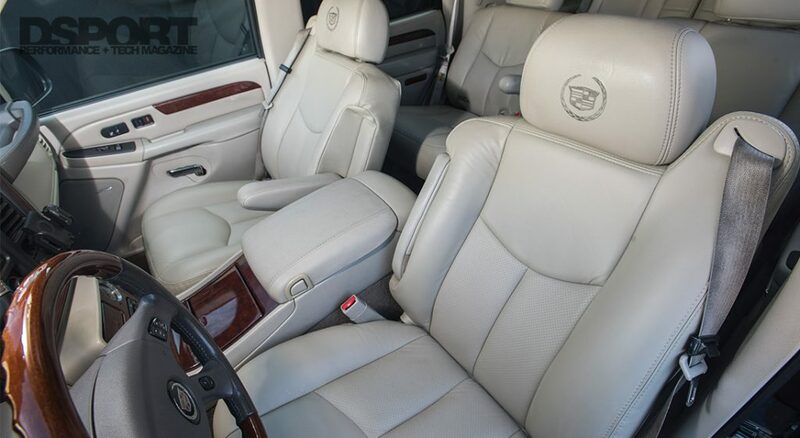 Leather interior, front and rear climate control zones, comfortable ride, seating for eight and the Cadillac crest bling deliver the luxury. A new Escalade is going to set you back $80-$100K by the time you pay for the taxes, tags and licensing fees. That’s definitely out of most enthusiasts’ budget. Fortunately, second-generation Escalades (2002-2006) can often be found in the $4,000-$10,000 price range. As for towing, second-generation Escalades have a tow capacity in the neighborhood of 7,500 pounds. Our 24’ Featherlite trailer weighs about 2,400 pounds empty while our Project RH8 R33 GT-R weighs in just under 3,500 pounds, a total of 5,900 pounds. Even a slightly larger enclosed trailer could be used and still be within the proper towing capacity. The engine and transmission offered in these Escalades is among the best-ever offered by GM. 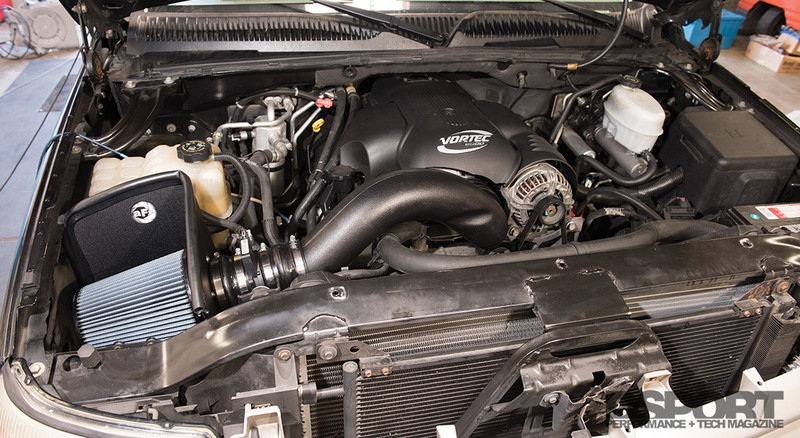 Models featuring the 6.0L LQ9 High-output (LS-type) V8 engine are the most desirable. These deliver an impressive 345 horsepower. The LQ9 is a cast-iron block aluminum cylinder head engine. The cast-iron block adds durability and provides a strong foundation when forced-induction is on the horizon. Despite having over 210,000 miles, our LQ9 engine needed nothing more than some fresh gaskets (rocker covers and intake manifold) and some new knock sensors and harness. Total cost for a complete MAHLE upper gasket kit, plugs, wires, filters and Tribodyne engine oil was under $300. In the 6,000 miles that we’ve put on the vehicle, it hasn’t burnt a drop of oil. The transmission is a 4L65-E (upgraded version of the 4L60-E). This four-speed auto features upgraded clutches, planetary and input shaft over the 4L60-E transmission it replaced. Ours is working flawlessly and the transmission temp gauge never gets past the halfway mark. Finding the right second-generation Escalade proved to be quite the adventure. If you are lucky enough to find a clean title, complete Escalade from a private party at a reasonable price, buy it quickly. There simply aren’t a lot of them out there. 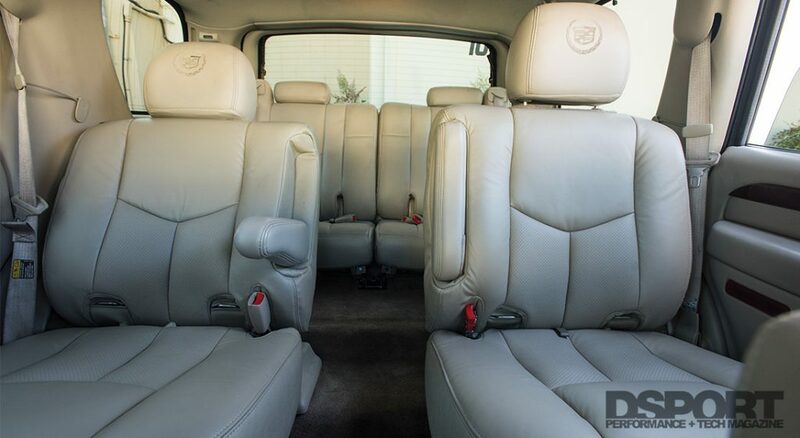 The majority of Escalades that we came across in the Southern California area had bad titles (salvage/theft recovery), were victims of major accidents, had missing third-row seats, had serious condition issues or had questionable service histories. We were ready to pay up to $10,000 for one that would need very little restoration work. 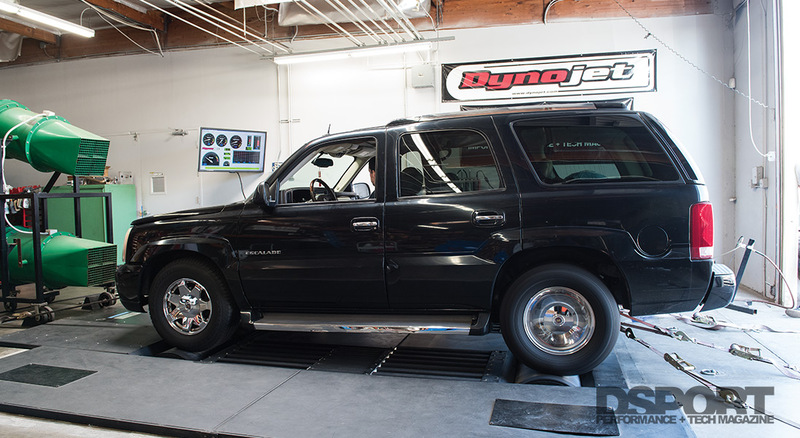 Unfortunately, the more expensive Escalades that we came across simply had fewer miles, but the condition was often far worse than higher-mileage versions. We even purchased one Escalade at night from a used car lot only to find out that it had a hole in the rocker panel once we got it on the lift the following day. Thankfully, we had a 72-hour window to return it if unsatisfied (which is exactly what we did). Our search spanned about twelve weeks where we looked at over a dozen Escalades. Ultimately, we came back to one of the Escalades we originally wrote off. This Escalade needed new seat covers on the first two rows, possibly needed new carpets, had check engine lights glowing, needed a new paint job in the foreseeable future and it had 210,000 miles. On the positive side, it was a single-owner vehicle, never been in an accident and it didn’t have any body damage beyond some minor dings and scratches. The price was right at $3,800. It would be a gamble purchasing such a high-mileage vehicle, but we took the chance. So far, it’s paid off. 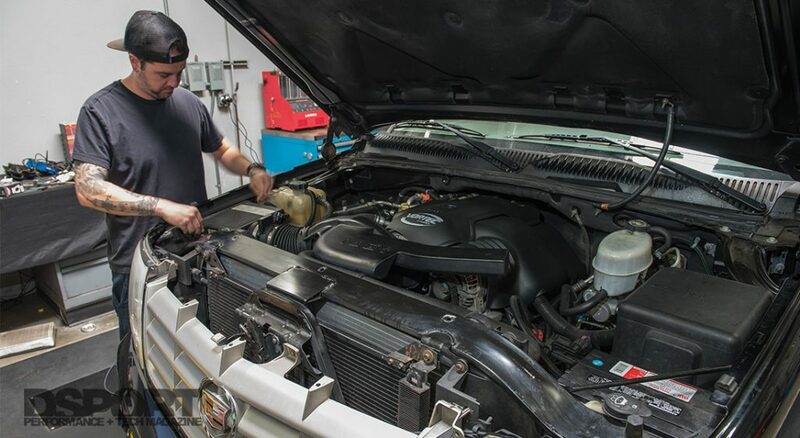 Mechanically, we have simply performed a tune up along with some gasket replacements. Working on the LQ9 is significantly easier than working on the original small block Chevy engines. Without a service manual in hand, Mikiko was able to replace the intake and rocker cover gaskets, perform a top-engine combustion chamber cleaning, install new plugs and change the oil in a day. This included cleaning up the mess resulting from having leaking valve cover gaskets on the engine for thousands of miles. An upgrade easily accomplished in any driveway, the new performance intake system added performance and a pleasant intake growl. While restoration is always part of the equation on an older project vehicle, upgrading the vehicle to perform better than new can be even more rewarding. In the upgrade department, our plans involve more power, improved braking and updated in-cabin entertainment. For power upgrades, we are going to be using our Project BLT to test a number of upgrades for the LS engine. This month, we tested just about every intake air system we could get our hands on. The results were extremely interesting. The panel filter upgrades added about 6-7 peak horsepower. We then tested five full air intake systems which all managed to increase peak horsepower output by 14 horsepower at the wheels. Since performance was nearly identical on these, selection came down to personal preferences and budget. We opted to go with the AFE Power intake system due to its composite pipe (looks OEM) and heavy-duty air box assembly. Next, we plan to test out some cat-back exhausts and possibly some headers. Eventually, we may even opt to add a supercharger. The brakes on second-generation Escalades are better than first-generation Escalades, but still fall short of what we’d like to see. Brakes are among the most taxed components when towing. Brakes that are marginal before towing become dangerous when towing. A braking system that is exceptional when not towing may be simply adequate when towing. For this upgrade, we are still doing our research as there are quite a few available options. Once we finalize our wheel selection (running 18- or 20-inch wheels and tires), the choices will be narrowed down. If your daily-driver or tow vehicle isn’t going to be entertaining you with its raw performance, it should be entertaining you with its sound system. We plan on upgrading the dated navigation system, installing about 1000W of amps and replacing all of the speakers to put the driver in the front seat of his or her favorite concert. 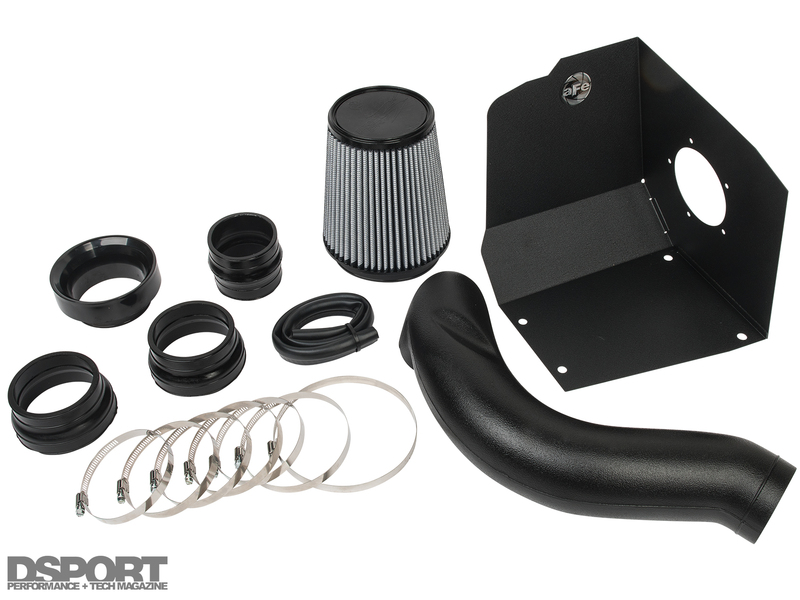 Although all of the intakes tested made about the same power, we selected the aFe Power air intake 51-1009. It made 14.18 HP over stock, a 5.1% increase. 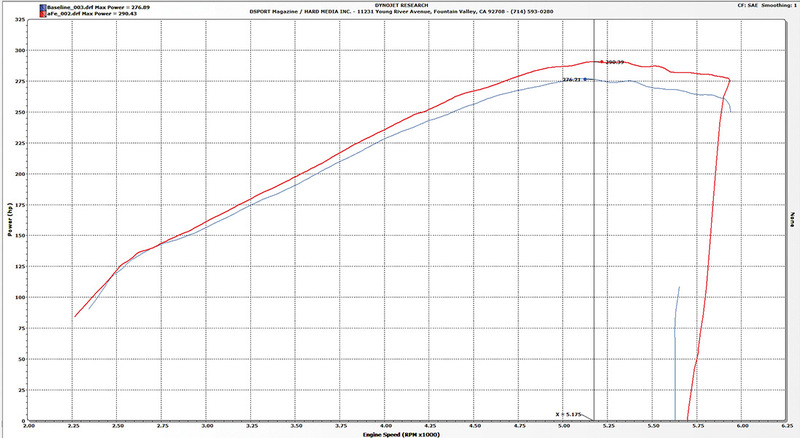 After its tune-up, we ran Project BLT at Fontana Dragway and managed a best of 15.51 at 87.79 MPH (1/8mile 9.976s@70.47MPH). With just the addition of the AFE Power air filter system, the Escalade ran more than a tenth of a second quicker in the 1/8-mile when running at Irwindale Speedway (9.868s@71.55MPH). This was an equivalent of a 15.36 at 90.01MPH according to your standard converter. Getting into the 14s should be possible with a few more CARB-legal upgrades. Not too bad for a 5,600-pound vehicle with driver. After the mechanicals of the Escalade were addressed, focus turned to the interior. Both the carpet and seats (front two rows) needed to be addressed. We first tried using an environmentally-friendly Chem-dry cleaner that ended up doing nothing more than making the carpet wet for three days. We then decided to pull out the carpet, attack it with some Simple Green HD cleaner and a carpet brush before using our pressure washer to remove all traces of the cleaner from the carpet. Failing to remove all traces of the cleaner or a detergent simply makes the carpet attract more dirt. Once the carpet was cleaned and dried, we sprayed it with Scotchguard carpet protectant to resist staining in the future. It was quite a project in terms of time, but not in terms of money. The results is a very clean and presentable carpet. As for the seats, we figured we had three options. First, we might be lucky enough to find complete used seats on eBay or Craigslist. Second, we might be able to find replacement seat covers. Third, we might just find a local upholster to make custom covers. The price of used complete seats ranged from $300-$800 per seat and we needed four. It was next to impossible to locate all four seats, and buying used on eBay is always a risk. As we explored the replacement seat cover options, we also visited our local upholstery shops. 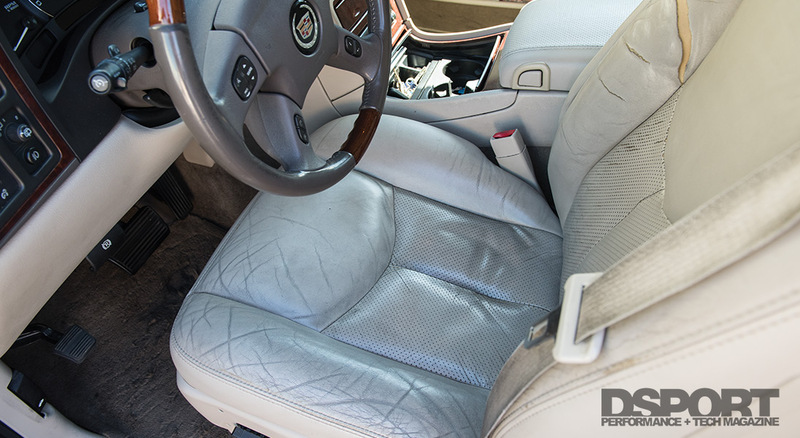 The cost from an upholstery shop to redo those four seats in leather was over $3,000. Now, we were banking on finding a quality seat cover replacement. Searching on eBay, we came across a manufacturer in Texas called The Seat Shop. The Seat Shop offers seat covers that meet or exceed the quality of the OEM cover in every measure. First, the material sourced is an exception match to the factory material in terms of quality, thickness, grain and color. Second, every one of the leather hides is individually inspected before being scanned and cut in the CNC cutter. Since the computer can place the shapes from the patterns around the defects and blemishes in the complete hide, waste is minimized. Third, all of the stitching replicates the factory seat covers. Finally, all of the hardware on the seat covers is identical to the factory hardware. This eliminates using self-tapping screws (required with some other seat covers) to secure the material to the seat. 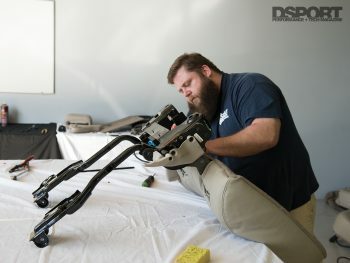 We were fortunate enough to have Brian Verhalen of The Seat Shop come to our facilities to teach us how to properly install a seat cover. While it will likely take you about two hours on the first piece that you remove and install the seat cover on (seat top or seat bottom), you will get progressively quicker with each subsequent seat cover. Any seasoned do-it-yourselfer should be able to handle this as long as they have a commercial steamer on hand. We found ours on Letgo for $85. As long as all of the factory foam is intact, the process should be straightforward. If the foam does not return to its original shape after steam processing and additional foam must be added, you may want to bring your seats and new covers to an upholstery shop to complete the work. The most likely seat to need a replacement cover is the driver’s seat. The bottom of this seat experienced the most stress and is the most likely to need a replacement foam. Fortunately, The Seat Shop offers this foam so that the installation of the bottom cover with new foam should be the easiest of all. The Seat Shop also offers replacement heating strips. The new strips can replace failed strips or replace the old strips before they fail. As for cost, a single seat bottom or top replacement cover in leather and vinyl (OEM configuration) is going to run just over $200. When an entire row is ordered at the same time, an additional discount is applied. In fact, an entire front row (two tops, two bottoms) with new driver’s seat bottom foam is under $850. We could not be happier with how the seats turned out. They look, feel and even smell new. While The Seat Shop has covers for just about any popular domestic platform, they currently only offer a few seat covers for Japanese imports (Acura MDX, Acura TL, Toyota Tundra, Toyota Sequoia). This may change. The Seat Shop is always open to add new applications as demand requires. If you are in need of quality seat covers for an application currently not available, simply let The Seat Shop know.